The kids’ school has branded jumpers and fleeces with the school logo on, although you can wear anything the right shade (which is not purple, the camera lies, it’s burgandy, honest). We have in our collection several fleeces, some bought new (at over a tenner a pop) and some bought from the PFTA second hand school uniform sale (where they are still the most expensive item there at £2 each). They obviously have some kind of zip flaw going on as for the second time one of ours managed to loose a zip pull, the zip teeth were still there, no sign of the pull. Last time I decided to replace the zip. Much unpicking and swearing later I realised how complicated this trivial job would be and I gave up and threw the darn thing away (shock horror, but in my defense this was a fairly well worn second hand one and even my mum agreed it was not worth the hassle). So this time I thought I’d try a new tack, maybe make it into some kind of pullover, possibly cut the zip out and sew up the front. I wasn’t sure. I took it out to have a look at. 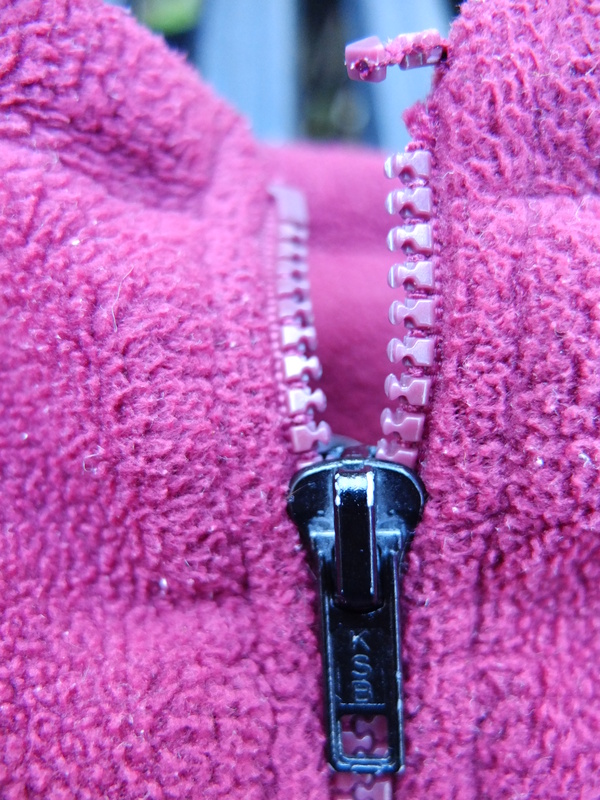 What I really needed, I mused, was a new zipper pull bit. But where to get one. Then I spied one on the table. It had appeared apparently from no where. I assumed it was from the big bag of bargain zips I’d bought from the Make do and Mend pre loved craft swap group and set to work. I checked it was the right size on the side that it could just slip in on. Then snipped the top on the other side, slid the zip on and then sewed up my gap. And voila, as good as new (and I bet no-one ever notices the zip pull is black not burgandy). I was so chuffed with myself. It turned out in the end the zip pull had come off a reflective vest of hubbies so I’ve been instructed to give it some new kind of fastening (I’m thinking poppers (snaps) ).